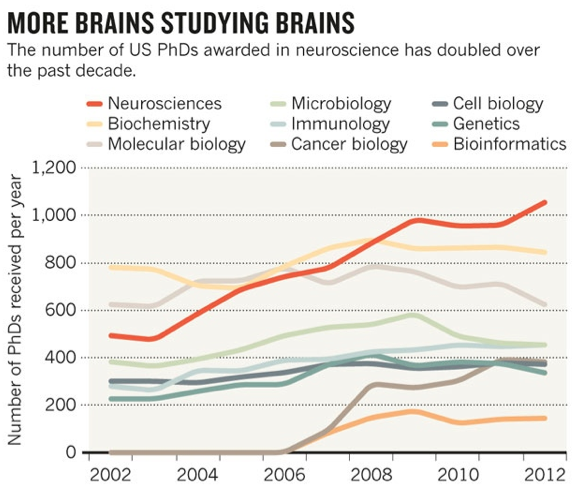 Nature has recently summarized the evolution of the number of PhDs in Biomedicine awarded in the US. The data comes from a report by the NSF (haven’t read it), and tells us of the picture for the first decade of the 21st century. Even if I have been a witness, as I started my undergraduate studies in 2001, I am a bit shocked by some trends. For instance, the progress in Genetics seems clearly halted. It stops in 2007 indeed, the very year that represents the start of the current ‘GWAS era’! It might be that it is not Genetics Genomics that is spreading, but that people in other fields are incorporating it massively? Three further trends are more impressive to me. To start with, the evolution of Neuroscience is amazing. This increase will be complemented by several big cash projects going on, such as the BRAIN Initiative or the Blue Brain Project. These initiatives resemble the Human Genome Project… and we all know by now that when cash gets in, stocks go high. Neuroscientists will be busy for decades! Second, the pace of change for Cancer Biology is also amazing. But I wonder whether this is more about a change in scientists (e.g. calling themselves “Cancer Biologists” instead of “Cell Biologists”), rather than a new field being born. Finally, I was impressed not by the rate of change, but the magnitude of PhDs produced in Immunology. Naively, I would have bet it was a minor field in Biomedicine, well below Genetics, Microbiology, or Structural Biology. My apologies if there is any immunologist in the room! Anyhow, a quite different picture emerges if we try with Google Ngram. This is a very cool tool that permits to check the evolution in the appearance of selected words. It looks upon >5 milion books published from ~1800 to 2008. Genetics and Immunology have been clear leaders during the 20th century (along with Molecular Biology or Cell Biology, for sure). But several “new” fields have emerged in the very last ten years (look at Genomics!). And if one looks at this picture, it seems that Immunology is struggling bad…since the mid-80s! It is very difficult to foresee who is gonna be the next guest star. Structural Biology was the top candidate in mid-90s, according to my PhD advisor. But it was Big Genetics who happened to be the elephant in the room. Is it time to get bullish for Neuroscience?